Includes 1 hand painted oval wall mirror and 1 hand painted half round table. This Hand Painted Mirror and Table Set is handmade of wood and mirror with hand-painted finish. The detail and craftsmanship is unparalleled. It is intricately detailed and distinctive to add beauty to your home. 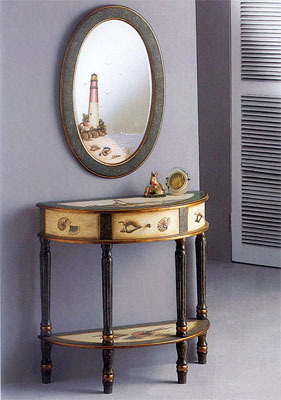 Mirror: 19.75 inches W. x 29.75 inches H.
Table: 31 inches W. x 11.75 inches D. x 30 inches H.